"When you walk in, this home gives you a big hug!" "Your pictures don't do this home justice!" Gorgeous, 3500+ square foot, hand-peeled cedar log home that is updated every year. In Spring 2017 we installed granite in the kitchen and master bathroom; high quality carpet throughout; and now have a brand new leather Living Room set and new comforters. We also have newer, premium pillow top, gel mattresses for the 3 King Master Suites. Long driveway with dramatic stone walls takes you to its entrance. Spacious, beautifully landscaped yard with plenty of parking. 3 King master suites with private baths, flat panel TVs in every bedroom. Main master BR features beautiful River Rock gas fireplace and premium indoor jacuzzi. Other high-tech amenities: XBOX plus Nintendo game cube for younger kids; bring your music and control the system from your phone, DVD, high-speed wireless, video library, Pandora & Netflix TV apps. Mudroom entry has an industrial size boot/glove dryer, tons of ski & coat hooks hooks, places to hang wet clothes plus washer and dryer. We have been renting vacation homes to families for 20 years, thus we are experienced (making the transaction highly easy and organized) and trustworthy (see reviews!). We are skiers who love log homes and rustic but elegant mountain decor. Big 2017 upgrades. New carpet, new granite, new leather couches in LR. Brand new premium, gel top mattresses, HUGE bedrooms, TV in every bedroom, high end hot tub, 12' river rock fireplace, 2 big entertaining areas (great room + loft pool table area). Right in Okemo Mtn. community. ..and <1 min from Okemo base. Conveniently located right in the mud room entry area. Sonos wireless music system you control from your phone. Huge lawn out front, enough for family baseball game! Beautiful, private wooded area off back deck (next to hot tub). You can go Boating on Echo Lake, Lake Sunapee, Lake Bomoseen, and many others. Most lakes rent canoes/stand up paddle boards/etc and larger lakes rent power boats. The Okemo base is 1 mile away. Okemo Valley Golf Club is 5 minutes away. Huge, high end jacuzzi hot tub on back deck. Great location, clean, great layout, very cozy! We had a great time at this house. Everything went as planned and house is as described. Frank and heather are easy to work with. House was very cozy.. didn’t like the idea that there was a car in the driveway and a man kept coming and going they out the day.. felt very uncomfortable! I booked Frank's place for a team offsite. Everyone loved the house and there was enough room for 9 adults. Thank you again Frank! My family traveled to Ludlow for our annual long weekend getaway after the New Year. This home was perfect and well suited our needs. Heather was very accommodating to us and we look forward to booking this warm charming home again next year. Thanks again! Excellent time and perfectly located! Came up to Vermont for an annual guys golf weekend and stayed in this amazing log home built for a king! The home is perfectly located within a stones throw from town but quietly set back into the mountains. We will certainly book this home again next fall for more great memories. Foliage season is also a spectacular time to stay at our place. Just minutes to Okemo base lodge (home of the best snow in VT no matter what the weather), and within 30-40 minutes of Killington, Stratton & Bromley. Perfect for snowmobilers w/easy access to VAST and on 1 wooded acre. Golf: Minutes from the best golf courses in the State of Vermont (Okemo Valley). This home has an Xbox-based golf simulator which will coach you on your swing or enable you to play an executive course with others even if it is raining outside! 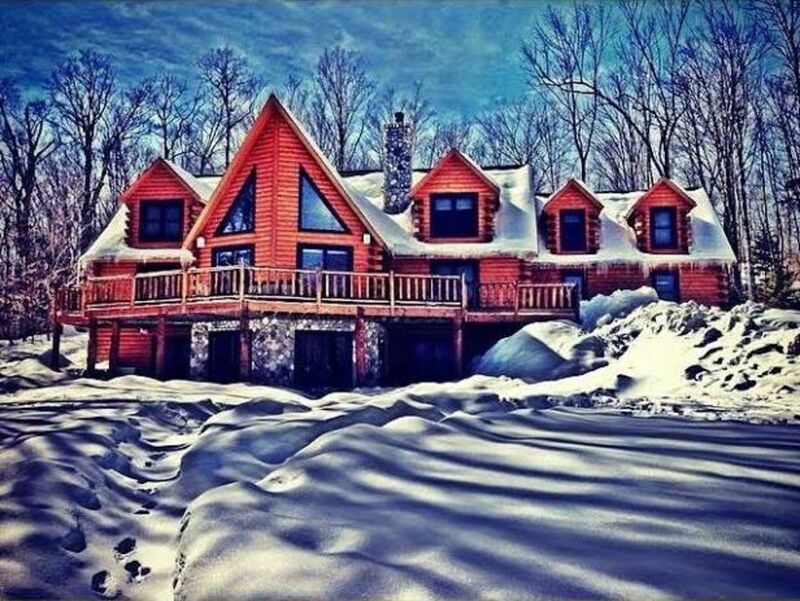 Ski: This home is in the Okemo Mountain community, located less than 1 mile to the main base lodge. Okemo is Vermont's most well-groomed and family-friendly mountain in the east. When snow conditions are questionable, your best chance of reasonable conditions is Okemo given their extensive snow making operation.